Bison Stats: Tait 2+1, Bordowski 1+0, Cowley 1+0, Harding 1+0, Klejna 0+2, Norcliffe 0+2, Ralph 0+1, Sampford 0+1. Wildcats Stats: C Jones 1+3, Hoog 1+1, Nell 1+1, Birbraer 1+0, Plews 1+0, S Jones 0+2, Bebris 0+1, Bullas 0+1. After Saturday night�s great win in Swindon, it was back to our barn for the 2nd Leg of the Semi-final. Would Bison continue their impressive recent run of home form or would Swindon be party poopers and book their place in the final. With only a slender one goal lead, it was going to be a cracker, that's for sure!! I'm sure it didn't start as they planned for Bison, when Coach Ashley Tait, was called for Hooking at 1.24. Thankfully, they managed to see off the penalty and returned to full strength, avoiding giving up an early goal. Then at 7.15, Wildcats Sam Bullas was called for Holding. Again, the team�s PK units killed the penalty. Both netties were called into action, soon after, when George Norcliffe brought a good save from Renny Marr, and then Maxim Birbraer went down the other end and tested Alex Mettam, but he saved the shot well. It was a pretty end to end game, as expected. Then a Swindon attack broke down and Ash Tait & Russ Cowley came away up ice on a 2-on-1. Tait entered the Wildcats zone, before passing to Cowley and Russ wristed the puck, high into the net behind Marr, to give Bison the lead. Goal timed at 15.12. Michal Klejna also picking up an assist. The Bison faithful celebrated loud & proud. Just before the period ended, Wildcats Player/Coach Aaron Nell, picked up a Hooking call, timed at 19.33. At the buzzer, Bison lead 1-0, but more importantly, 5-3 on Agg. The 2nd Period started with Bison on the Powerplay, but just like the 1st, Ashley Tait got penalised, just after a minute. Another Hooking call was awarded, timed at 21.09. Swindon returned to full strength & Bison would do the same soon after. Swindon were playing well and creating good chances, but the Bison D-men and Alex Mettam were doing their best to soak up the pressure and clear the zone. However, at 23.58, a poor clearance was jumped upon by Tyler Plews and he levelled the score on the night, by wristing a lovely shot, past a slightly unsighted Mettam. Bullas & Hoog awarded assists. Thankfully, it didn't take too long for Bison to respond. Adam Harding & George Norcliffe battled hard in the corners to bring out the puck. Norcliffe positioned himself to shoot and got away his shot, which Harding managed to tip and it redirected past Marr, who claimed Harding had impeded him, but Matthews didn't agree. Goal timed at 25.28 and Alex Sampford also picked up an assist. At 32.23, it got better for the Bison fans, when Tait won a battle on the boards against Godfrey and skated in on Marr. He deked slightly to the right and finished clinically, top shelf over Marr's glove hand. Bison now had a 3-goal advantage on aggregate (7-4). Entering the final minute of the period and George Norcliffe chased down a seemingly easy puck to play, but Plews lost an edge and fell over. George pounced and in one quick motion, passed to an on-rushing Richard Bordowski, who roofed the puck, to just beat the buzzer. Goal timed at 39.57. This sent the Bison fans into a frenzy. Now a 4-goal advantage over Swindon and I bet not many fans would've predicted that scoreline at 40 minutes. With only 20 mins to play, between Bison booking a place in the Final, could Swindon make an incredible comeback or would Bison continue their dominance on home ice. It didn't start that well for the visitors, when at 41.06, Sam Bullas picked up a 2 + 10 Boarding call, when he levelled Ashley Tait into the boards. Despite his protestations, Bullas finally entered the sin bin, to sit his penalty. However, from the restart, Swindon scored a short-handed goal. Chris Jones setting up Birbraer and his shot flew past Mettam, in off the post. Goal timed at 41.13. The comeback was on. Swindon killed off the minor penalty of Bullas's and returned to full strength. At 46.40, Bison's Chris Cooke was given a Hooking call, but Bison would kill it off successfully. Just as Bison returned to full strength, they went forward and almost extended their lead. Ashley Tait & Adam Harding skating in on a breakaway. Tait would choose to shoot instead of passing, Marr saved but the puck popped up in the air, which Harding batted down, but the puck went agonizingly past the post. With just under 10 minutes of the game to play, Swindon staged a revival. Jonas Hoog being the quickest to get his stick on a loose puck in the goal crease, after Mettam had made two great saves, but was unable to hold on and cover the puck. Goal timed at 50.13, assists going to Chris Jones & Nell. Exactly a minute later (51.13) and Swindon scored again, Nell this time being the quickest to react to the loose puck, of another goalmouth scramble. The scoreline on the night was tied at 4 each, but Bison still just held that slim advantage. It was going to be a very nervous last 8 minutes. Bullas returned to the Swindon bench, after serving the full 12 mins of his penalty. As hard as Wildcats tried, the Bison players did everything they could to break down all of Swindon's advances. The minutes were slipping away for the visitors. We entered the final 2 minutes. Now it was all down to the Wildcats bench to see what they could do to get this one goal that would tie the overall scoreline and possibly take it into overtime. We entered the last minute and with Wildcats up ice, Renny Marr was summoned to the bench in favour of the extra attacker. However, Wildcats lost possession and Tommy Ralph flipped the puck out of the Bison zone. Ashley Tait outmuscled the Swindon player on the boards and skated into the Wildcats zone. With 2 Swindon guys between Tait and the empty net, he took his time, moved slightly right and fired the puck into the net. The whole place erupted, with Bison players and Fans celebrating alike. Goal timed at 59.21. Wildcats called a Time Out. From the restart, Marr went straight to the bench. Amazingly, Swindon did score again, but it wasn't enough, as they needed 2 goals. Chris Jones with the goal, assisted by Sam Jones & Edgars Bebris, timed at 59.58. 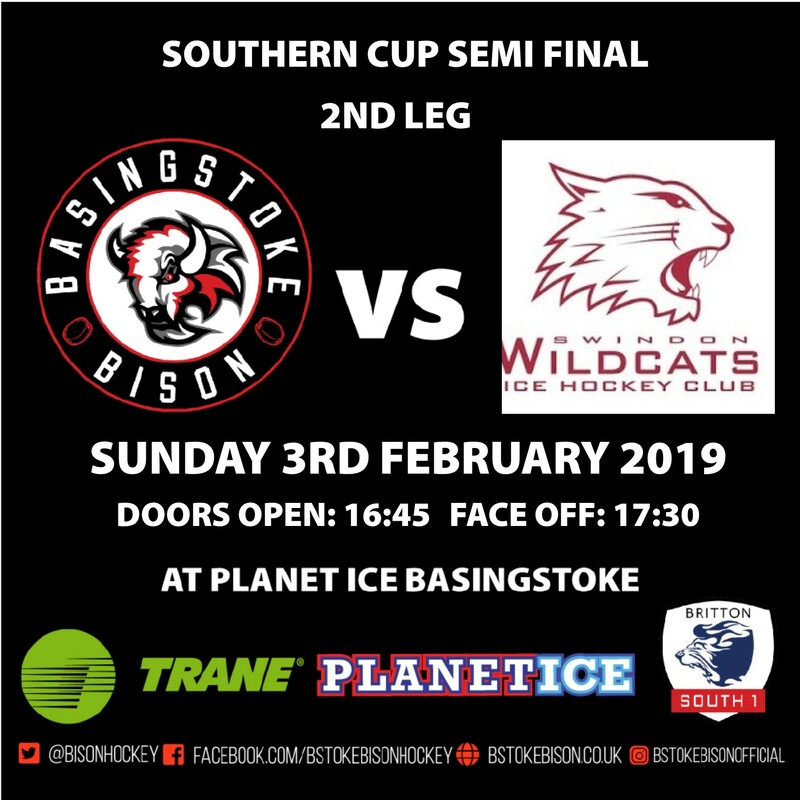 The final 2 secs ran down and at the final buzzer, Bison had made the NIHL South Cup Final, by the aggregate score of 9-8. Full credit to Swindon Wildcats for one hell of a game/fightback and for never giving up, even after the 2nd period, when it looked so slim that they would be able to pull it back. Many Congratulations to Ash, Tony, John and all the players for making the Final. At the moment we have no idea who the Bison will face, as only 1 leg has been played in the other Semi-final, with Phantoms holding a 6-3 advantage.